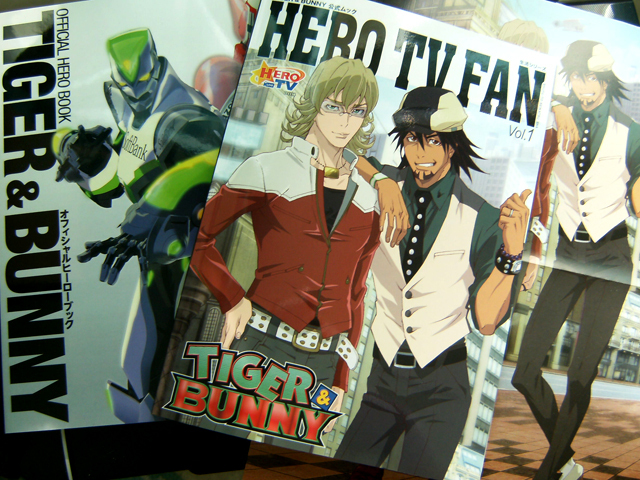 The Official Hero Book and Hero TV Fan vol. 1 came out on Monday. Both books have pretty similar contents, but the presentation is different. The Official Hero Book seems higher quality than the Hero TV Fan book. It has a jacket printed on thick, glossy paper and overall it feels sturdier than Hero TV Fan. Hero TV Fan gave me some confusion at first. It’s printed like a Western book, so it reads from left to right. I tried to start from what to us Westerners is the back cover and it took me a moment to realize that it actually was the back cover and I was trying to read the book the wrong way. I’m not quite sure why they chose to print it this way, though it would make localizing the book easier in the future, I guess? 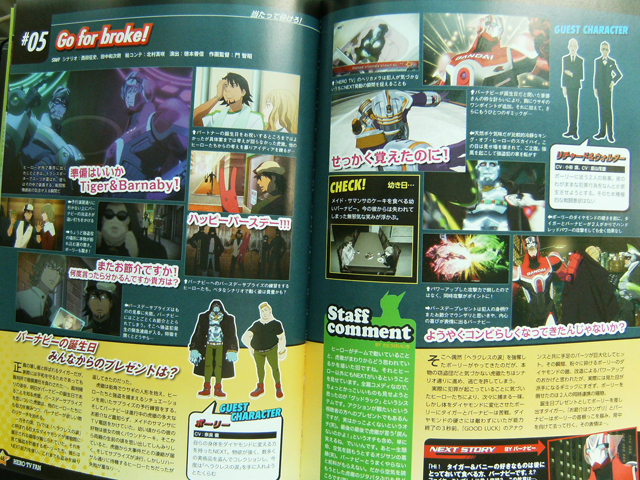 The Official Hero Book’s content is divided in clear sections, Hero TV Fan vol. 1 sort of bounces from topic to topic every few pages. I found Official Hero Book easier to read. Hero TV Fan vol. 1 comes with a two-sided poster that I have to admit was disappointingly small. Official Hero Book has less awkward Engrish (mostly a few typos and one total mis-romanization of a name), Hero TV Fan vol. 1 is pretty heavy on gratuituous Engrish. There are no complete character profiles in either of the books. No birth dates, heights, weights, blood types or anything. At first I was slightly disappointed by this, but we’ve gotten this far without that information so I don’t think it’s world breaking to lack it. Character pages winner: If you’re an artist or a cosplayer, both books deliver when it comes to reference images but Official Hero Book wins on presentation. Both books have guides to the settings and locations. 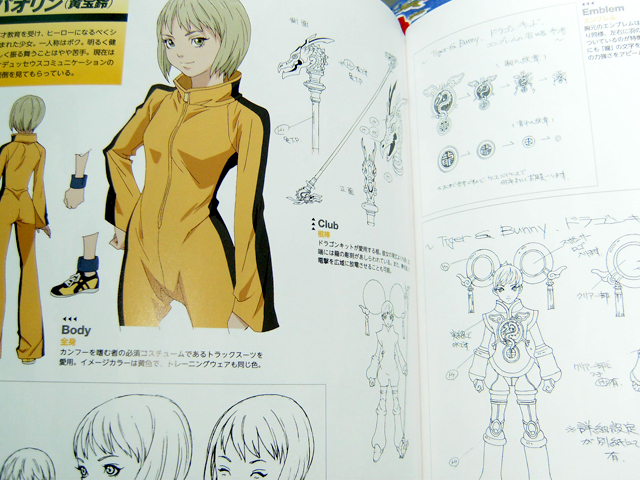 The guide is more expansive with detail sketches and descriptions in the Official Hero Book, but the illustrations are smaller. Hero TV Fan has an additional guide to the notable companies of Sternbild. Sternbild Guide winner: Tie, I’ll put this down to personal preference. Both guides do their jobs, and I’m not an artist so I am not sure which one an artist looking for reference images would prefer. The story guide spans the first cour of the series, episodes 1 to 13. Official Hero Book uses 15 pages, 1 per episode plus 2 pages for OP and ED. Hero TV Fan vol. 1 has two pages per episode with more commentary. Both books list the main staff for each episode, Hero TV Fan also has the full next episode preview text included. Story Guide winner: Hero TV Fan vol. 1. I still think the presentation is nicer in Official Hero Book, but Hero TV Fan has director Keiichi Satou’s trolling comments for each episode. Both books have four interviews, and the focus is very different between the books. Official Hero Book’s interviews are all black&white with just a few sketches to illustrate them. Hero TV Fan vol. 1 has full color photographs for most interviews. Official Hero Book focuses on the staff interviews with director Keiichi Satou, producer Kazuhiko Tamura and designer Masami Ozone, and screenwriter Masafumi Nishida. 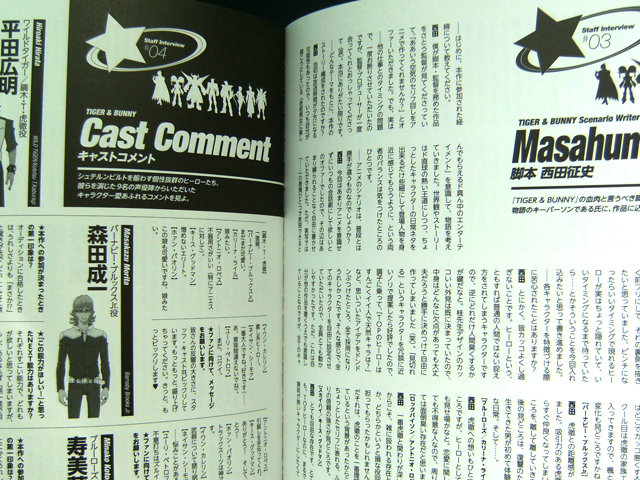 There’s also a section with mini interviews with all the main cast members (all eight heroes’ + Lunatic’s voice actors). Hero TV Fan vol. 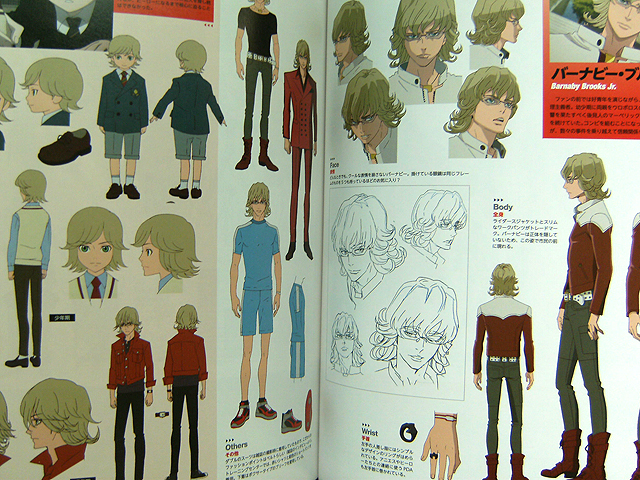 1 focuses on the voice actors. There’s three interviews with them and an interview with director Keiichi Satou. 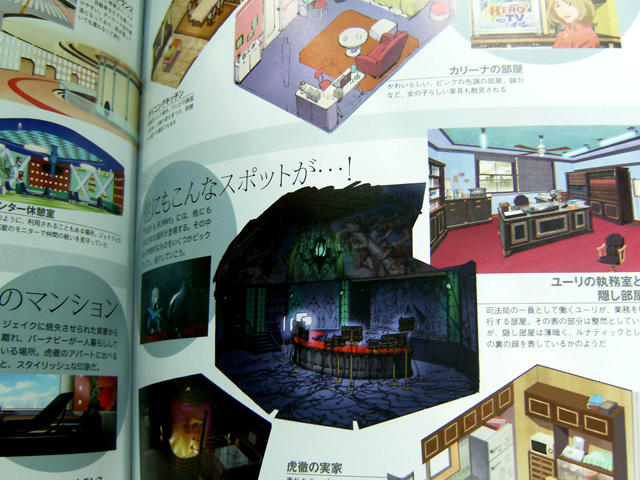 Satou’s interview is not the same that’s in Official Hero Book. 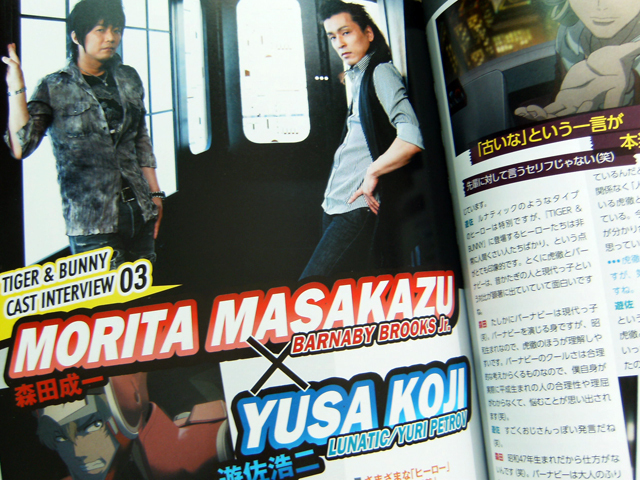 As a con only one of the voice actor interviews is new; the interview with Masakazu Morita (Barnaby) and Koji Yusa (Yuri/Lunatic). The other two interviews are reprints. Hiroaki Hirata (Kotetsu) and Masakazu Morita’s (Barnaby) interview in Cool Voice and Go Inoue (Keith), Kenjiro Tsuda (Nathan) and Taiten Kusunoki’s (Antonio) interview in Pash! Deeep. If you don’t have these magazines already and like the voice actors, you might want this book for the pictures. Interviews winner: Tie. Depends on what interests you more! 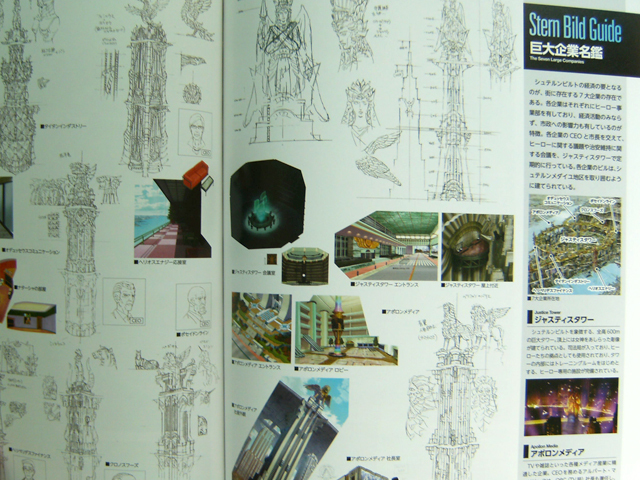 Official Hero Book has articles on spotting Origami Cyclone (I really hadn’t noticed him hiding in some of the scenes that were presented) and a feature on Scarf Girl. 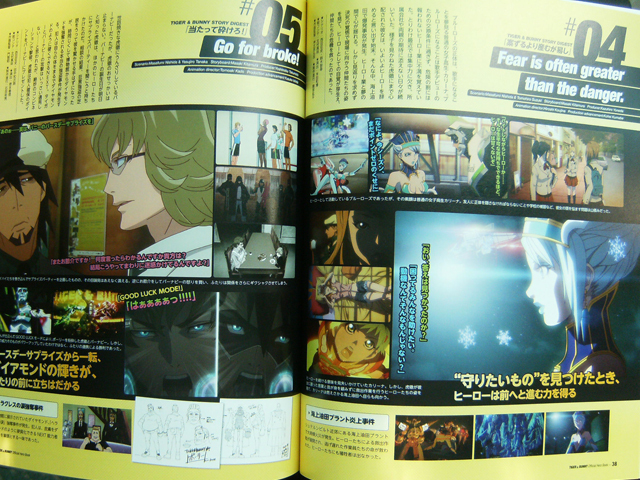 It also has a small section with storyboards, with best cuts from each episode. The section is half in full color, half in black&white. 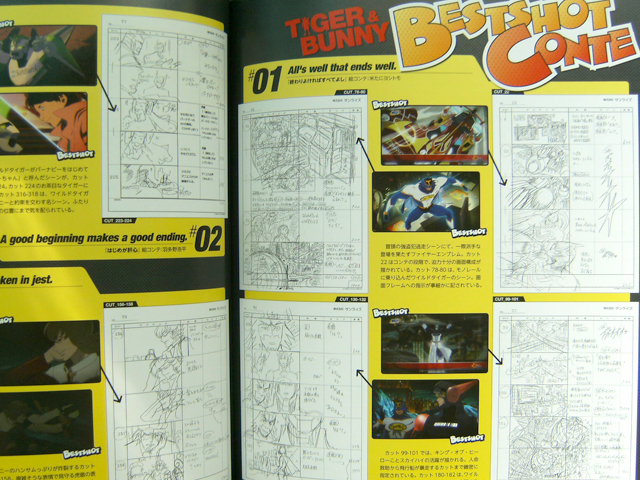 Some of the storyboards are drawn by director Keiichi Satou. Hero TV Fan vol. 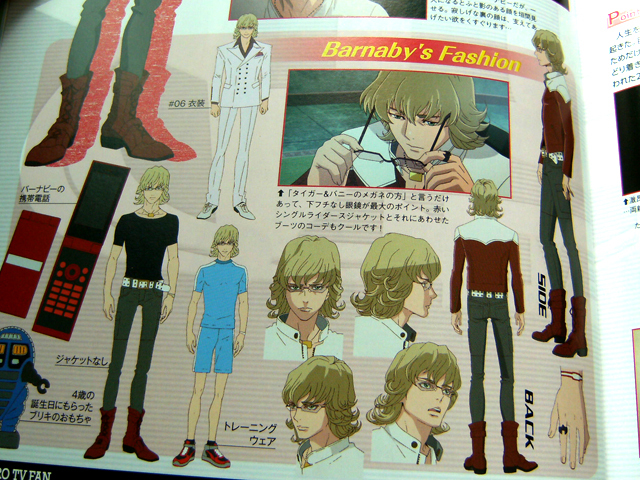 1 has a two-page feature on how Kotetsu and Barnaby’s bonds have evolved through the course of the first cour. There’s also Doc Saito’s machine guide with commentary. Other features winner: Gonna call a tie again. I liked the extra stuff in both books. I think both books are pretty good, but if I had to pick just one I’d go for the Official Hero Book. I am still happy about deciding to buy both. There’ll be vol. 2 of Hero TV Fan coming out in October, I expect Official Hero Book will get a second volume too by the time the series is over. If you have any questions about the books, I’ll do my best to answer them, but I won’t be posting any scans so please don’t ask for those. Yahooo! Thanks so much for this great review and comparison of the two books. Thanks for your comment, I’m glad to hear this was helpful! I thank thee for the great review! At the moment I have a _very_ limited budget (sadface), so your comparison helps me making a decision which one to buy (since I decided to buy one or the other). So, Official Hero Book it is. Thank you and thank you again!